Whenever the New York Times manages to crane its neck and gaze west, it becomes a whole thing. We rage when they’re condescending, cringe when they get us wrong, and get all doe-eyed and flushed when they like us. The latter was how most of us felt when restaurant critic Pete Wells awarded three stars to Santa Monica’s Cassia back in September. 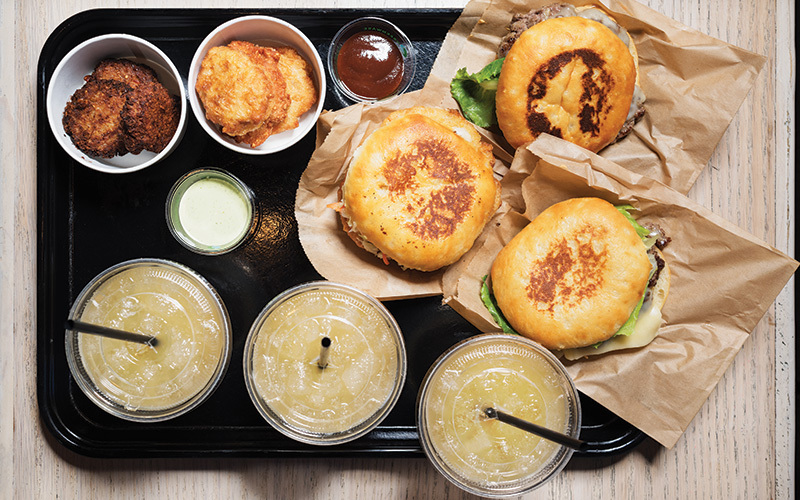 Yesterday, Wells again took aim at the West Coast food scene, this time by reviewing Roy Choi and Daniel Patterson’s socially, environmentally, and health-conscious fast food restaurant, LocoL. In stark contrast to Wells’ love letter to Cassia, this review is a sucker punch. In it, Wells awards zero stars to the restaurant, slamming the chili as bland, the burger as school lunch fare, and he says it’s best to pretend that the fried chicken sandwich never existed at all. Ouch. Roy Choi responded via Instagram, with a very Choi-ian statement about Wells now being part of the “DNA of LocoL,” and how the review itself is evidence of the power behind their mission. Sure, absolutely, that’s a very measured way to look at it. But while I laud his necessarily stoic reaction, I don’t share it. I spent the last year and a half working on a story about LocoL that runs in this month’s issue, and during that time I became intimately familiar with the operation, its founders, their struggles, and their intent. For the most part I agree with Wells—if the restaurant has one Achilles heel, it’s the food. Not that the grub isn’t good (I actually really like the Chicken Nugs), it’s just that it’s not good enough to steal the hearts and wallets of its target audience away from other options that aren’t also trying to ignite social change. No, why everyone should be grilling Pete Wells right now isn’t about whether his review is right or wrong—in my opinion it’s mostly right—but because the motivation behind doing it at all is morally questionable. There is no reason to spend 1,000 words of the New York Times precious space to say that a fast food restaurant doesn’t have great food. And it’s all the more reprehensible when that restaurant is also trying to change lives, save neighborhoods, and offer nutritional options where there aren’t any. A critic’s job is to be unbiased. I get that. Try to ignore all the peripheral aspects of a restaurant—just focus on the food. But then when is it a critic’s moral obligation to cross that line for the greater good? Sure, Wells probably steered a few folks away from a mediocre bowl of chicken soup and a dry chicken patty, but at what price? At the same time, it’s important to remember that LocoL is not a non-profit. It’s a business like any other, one with venture capital funding and celebrity hip-hop investors. Now, their hope is that by being financially successful, they’ll inspire other companies to include a social agenda in their business plan. But still, one could argue that if you’re making money on your food, you’re game. Especially if some of the people you’re taking money from are those for whom each dollar really does matter. If Pete Wells thinks they can have a better dining experience at the same price eating somewhere else, it could be argued that it’s his duty to say so. It could be, but it shouldn’t. In the course of my research I had a number of conversations with Daniel Patterson where he railed against the media for holding LocoL to different standards than the rest of the fast food world. Why does the sourcing matter so much? Why does everyone have an opinion on which neighborhoods they open in? And why does the food have to be so much better than, say, a Chipotle, when they’re offering things for the same price? The answer is, of course, Patterson himself—as well as his partner Choi. Their notoriety is the double-edged sword that opens them up to acclaim (when else have you heard of a fast food restaurant making Food & Wine’s Best New Restaurants?) as well as criticism. But hype alone should never be reason for punishment, no matter how tempting. Neither is ambition. One more little thing: If you’re going to slam a new enterprise, shouldn’t you focus on the flagship? Why did he hit on Oakland? It’s the newer of the two locations and certainly not the company’s flagship. Watts would have made more sense, but then, that may have required Pete Wells to go to Watts. (Instead he just throws in a few Jonathan Gold quotes about the grand opening.) Yes, a chain needs to be about consistency, but still, it’s an odd choice. Lesley Bargar Suter is the Food Editor at Los Angeles magazine.